Discussion in 'Member's Gallery' started by toni, Mar 29, 2008. I stopped by the garden center hoping to get some groundcover plants for a path, the ones I wanted were $4.99 a pot and I need 20 of them for even mediocre coverage. Needless to say they are still sitting at the nursery. I am thinking I will start looking for come creeping Thyme which they didn't have. 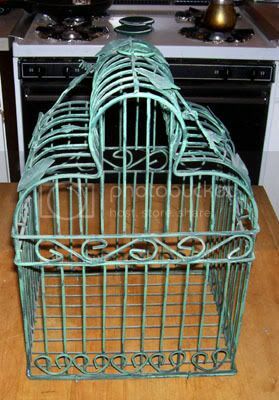 So I turned my hunt to finding plants for three decorative birdcages I have, a planter to sit on a pedistal in the shade garden and a hanging basket. The newest one being this one I found at my favorite thrift store last night. I knew I had been wandering around a looooooong time cause one young man asked me several times if I was still 'doing okay'....well yeah for cryin' out loud, I was walking thru a fully stocked garden center, pushing a partially loaded cart, fingers itching to dig in the dirt and a big smile on my face...how much more okay could I get and still afford to be there? I even had a coupon for a free 20 quart bag of potting soil. But sadly all my other coupons had expired .....yesterday!! You always have such great ideas for things. I can't wait to see the bird cages done. The flowers above are all gorgeous. Petunia's are one of my favorites. Thanks for sharing. Oh, drool-drool! Lovely flowers, and great looking bird cage. Can't wait to see where you put it and how it will look. Toni, another great find!!! Love, love, love the purple petunias. Are they the ones that smell so sweet? I got some the other day. They take me back to when I was 5 years old at my grandmothers house. She always had them, and they smelled soooo good!! I know the oxalis comes in purple and green (at St. Pat's day). Why is the purple so much hardier than the green, (I got a green one before St.Pat's day and it has already 'croaked'. Sounds like my kind of fun Toni! But sadly all my other coupons had expired .....yesterday!! That happens to me all the time!! don't know which I'm more envious of, the flowers or the idea of having time to get lost in a shop like that! I like your new junque and your blooms.You did good. Great looking flowers Toni. Those petunia's -usually purple, maybe its just the picture but they look blue. what true color are they? Thanks for posting, their so pretty. 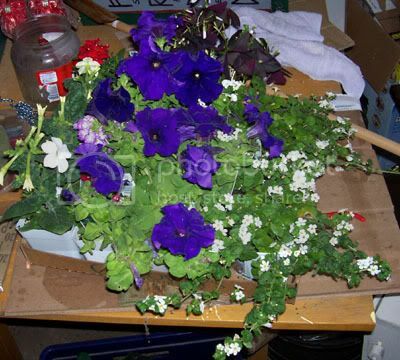 Petunia, they are a really dark purple. The tag says they are part of the series Aladdin-Nautical Mix. There are about 6 colors and mine are the darkest ones. I cannot wait to see you you transform that birdcage. I am so excited. 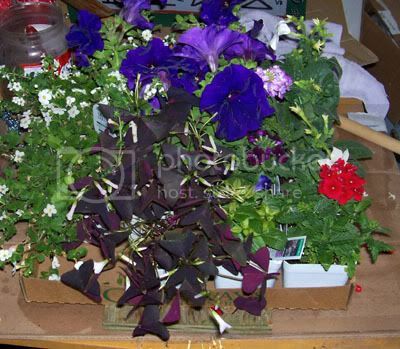 You got some lovely Petunias there - great colour - rich dark purple/violet.